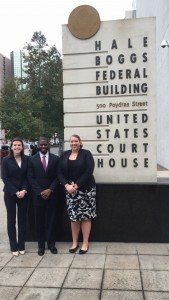 The Marquette Sports Law Moot Court team advanced to the final eight of the 2016 Mardi Gras Sports Law Invitational Competition hosted by Tulane University Law School. Please congratulate team members Alexa Callahan, Darius Love, and Nicole Ways. Professors Matt Mitten and Paul Anderson coached the team. This year the competition included more than 50 competitors and 26 teams.